In the restless, fast-paced world of music technology, five years is an impressive period for a single product to remain in production. Yet, despite an intimidating price tag, enthusiasm for Elektron's Machinedrum shows no sign of flagging. With the release of an enhanced model, the SPS1-UW, this seems an opportune moment to revisit what, for many, represents nothing less than the ultimate drum machine. Physically, you'd be pushed to spot the differences between the original and the new model. And, since we've already covered the original in depth, I suggest that you check out Chris Carter's words from the January 2002 issue of SOS to set the scene for this review. 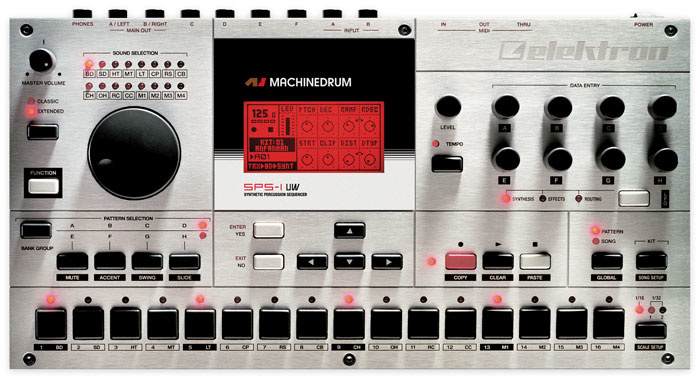 You'll probably recall that the Machinedrum is a drum machine boasting a highly sophisticated synthesis engine, or rather, engines. Its strength lies in Elektron's concept of software 'machines', each specialised for a particular type of synthesis but with enough flexibility to deliver all manner of wild, crunchy and occasionally screaming percussive tones. Indeed, the term 'drum machine' is way too narrow to cover the wealth of electronic sounds on offer. Previously, we saw that the MD employs a traditional grid style of programming with 16 steps comprising a typical pattern (32 steps being the maximum) and each drum kit assembled from up to 16 different voices, sourced from the various machines on offer. With a selection of basic effects, multiple LFOs, the dynamic tone-changes of 'parameter locks' and more, this was a box of tricks designed with sonic exploration in mind. Further plusses include its solid construction, the generous supply of individual outputs and the simple yet effective song mode implementation. Yet there were drawbacks. Like Chris, I found the red display wearing after long exposure and I also felt the restriction of such short patterns left insufficient room for subtle changes or variations. The fact that triplets are not catered for is a surprise too. However, the biggest shortcoming, for me, was the inability to quickly solo an individual voice when editing or performing. In the years since the original review, Elektron have upgraded the software to include an additional machine type: MIDI sequencing machines. There are 16 of these in total, one per MIDI channel, and they are designed to sequence external gear via the MD's tracks, transmitting notes, chords (of up to three notes), MIDI Continuous Controller data, aftertouch and pitch-bend. It doesn't end there either; two additional machines, named Control Machines, give overlord-type power over all other tracks simultaneously. The first of these machines (Control All) allows manipulation of other tracks' synthesis parameters, track effects and routing. The second (Control 8) brings eight of your most commonly used parameters together in one window for the same kind of global treatment. If you want to make sweeping changes that affect an entire kit, these are the machines for you. The additional MIDI machines are found in both the base SPS (Synthetic Percussion Sequencer) and the new 'UW' (User Wave) versions. Some of you may already be aware of the price difference between these two models; for nearly 400 more of our UK pounds, the SPS1-UW adds an external USB MIDI interface, 2MB of user wave memory and two completely new machine types: ROM machines and RAM machines. Briefly, these facilitate recording and playback of samples, although 2MB isn't much to play with, especially as it's shared by both the ROM and RAM machines and is not expandable. The idea behind this limitation is, apparently, to force the user to use sample memory 'wisely'. Worse, sample playback is fixed at 12-bit mono and there are just 32 slots for imported user samples. On the plus side, these samples are non-volatile and the sample engine features algorithms to eliminate noise and other artifacts of low-volume sampling. Existing SPS1 owners may be glad to hear that an earlier offer to upgrade to the new model's capabilities is being relaunched; check Elektron's web site for details. 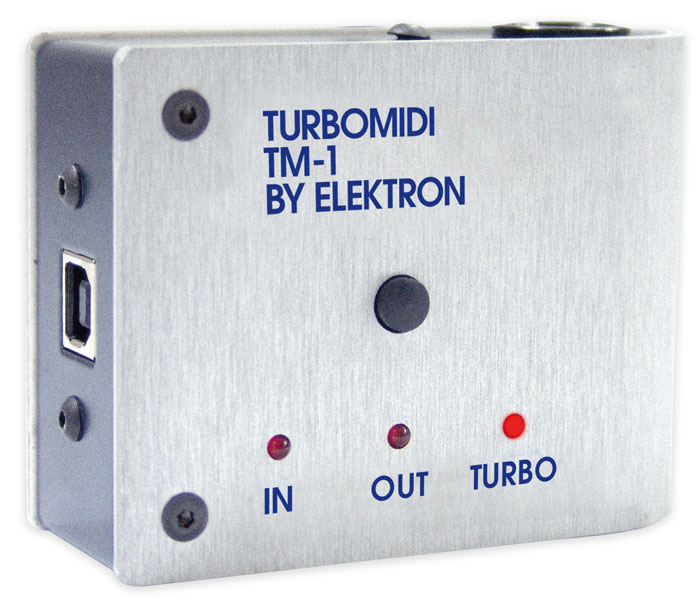 Included in the SPS1-UW package is a small, metal USB MIDI interface, the Turbo MIDI. For sample transfer to and from a computer, Elektron have opted for the rather slow MIDI Sample Dump protocol, sending and receiving all sample data across a MIDI cable, but they have devised this hardware to speed it up — purportedly by up to 10 times. There is no specific documentation included for this but fortunately, it didn't need any! I plugged it in and Windows XP recognised it right away. To transfer samples to and from the SPS1-UW, you must access its 'sample manager' menu in conjunction with a program capable of talking MIDI Sample Dump. Elektron supply a suitable utility for PC or Mac known simply as C6 and available as a free download from their web site. I duly grabbed it and can report that it is blessedly straightforward. An Explorer-style window is provided, into which you load samples, audition them, then transmit them to the SPS1-UW. You can even send a series of samples in order whilst you go and put the kettle on. Samples from 4kHz upward can be accomodated and regardless of the source bit rate, the Machinedrum plays back all its samples as 12-bit. Since the SPS1-UW only handles mono samples, you are offered the option to merge stereo WAV (or AIFF) files or transfer only the left or right channel. You can permit the file's source looping information to be maintained or force looping on or off as required. Finally, the ubiquitous commands copy, paste and clear are found in the sample manager menu. With these you can permanently store samples recorded into the RAM machines in ROM locations. The RAM machines' contents are otherwise lost on power down. ROM Machines are basically the means to play back your own samples. 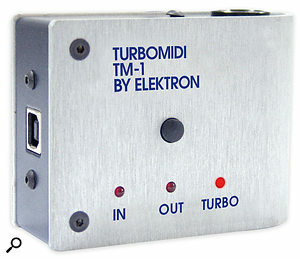 Having imported your samples (see the 'Turbo MIDI' box for more about this), they are then are referred to internally as ROM 1 to ROM 32, rather than by their original names. As with most of the machines, there are eight tweakable parameters on the Synthesis page; you can modify sample start and end points, the number and spacing of sample repeats, decay and hold time and bit-rate reduction. This latter feature reduces the sample quality down as far as 2-bit if you really like your grooves grungy. Memory locations ROM 25 to 32 are optimised for the playback of loops. For these samples, the start, hold and end parameters operate in a linear fashion, with every 16 numeric increments equivalent to a beat or quarter note within the loop. This is very useful to keep your loops sync'ed neatly, even when you chop them up, reorder them and so on. There's no doubt that samples greatly increase the MD's arsenal: your songs can now include favourite kicks, loops and percussion not so easy to synthesize, as well as basses, vocals, sound effects and so on. Well, as much as you can cram into 2MB anyway. RAM machines are a little more involved and are divided into two types: recording and playback. Although you can sample audio generated internally, their main aim is the live capture of loops. The manual deals with user sampling in a couple of pages, under the title 'Using the SPS1-UW in a DJ setup'. It guides you through the process in easy stages, starting with use of tap tempo to sync the MD to an incoming audio source, then assigning a RAM record machine to record it. Finally, a RAM playback machine is required to trigger your captured loop. From here on it is treated like other MD machines and modifiable by creative use of filters, effects and so on. Especially handy is the ability to retrigger and slice loops, reverse portions of them, remove sections and so on. Using the traditional MD tools on your own loops is mightily cool, and there are numerous ways to render source material completely unrecognisable. As with ROM locations 25-32, the parameters of RAM machines are scaled in a linear fashion, so you can work intuitively in beats or quarter notes. To exploit RAM machines fully, you allocate one track for each record machine (up to two are available) and then have separate tracks play back the results. Using four of your 16 MD tracks, you can therefore record and playback two separate loops of up to two bars. As I mentioned, the ROM and RAM machines share the available memory, so if you have already stored lots of your own samples, less space remains for live sampling. Interestingly, recording quality is adjusted automatically according to the available space although there is a finite (but unspecified) amount of memory reserved, to ensure you are always able to sample something. Although I'd never played a Machinedrum prior to this review, my expectations were high. I have to admit that in the first hour I kept asking myself 'what on earth?' The sounds and patterns, as delivered from the factory, are far from impressive; it's only when you start to program your own kits and grooves that you get an inkling of what MD advocates get so excited about. Referring to the UW version specifically, it is hard to overlook the limited RAM count or the mean number of sample slots. Elektron say that you should 'make the most' of its limited sample quality and storage, which would be a fine sentiment for an inexpensive add-on but I'm not convinced this applies so well here. Although I grew to appreciate the Machinedrum's synthesis and the wonders of its sequenced parameter locks, I couldn't shake the thought that, for the difference in price between the basic model and the User Wave version, you could buy a Korg ESX1 Sampling Electribe! Whilst I agree that 12-bit samples have a charm of their own and work well under many circumstances, I'd prefer to be able to choose when to use them. And whilst transferring samples using the included Turbo MIDI interface is much faster than via any other MIDI interface I've used, it is still a poor substitute for sample import via external media, or via a built-in USB port. Admittedly, for small transfers it isn't so bad and even a full memory load only takes a little over two minutes. The most limiting aspect from my point of view was being tied to a computer each time I wanted to move samples around. Despite the shortcomings I've noted, both the SPS1 and SPS1-UW are remarkable drum machines whose unique approach to synthesis can, with time and familiarity, unlock a treasure trove of evolving, chaotic sounds or rough, electronic beats. With the inclusion of the SPS1-UW's ROM and RAM machines, Elektron have pushed its capabilities into potentially exciting areas far beyond the scope of the original model. If you are looking for a high-end drum machine that exudes personality and has the potential to produce strikingly different percussion sounds for years to come, check it out. A freakily unique drum box! User Wave option opens up fresh avenues of sonic manipulation. Now includes 'MIDI Machines' for control of external devices. 12-bit sample playback and 2MB memory limit could be too restricting for some applications. Only 32 user sample locations. Sample transfer only via MIDI Sample Dump. This deep, uncompromising drum machine adds sample playback and real-time sampling to an already powerful synthesis engine. Summing it up is not easy because the SPS1-UW is a frustrating marriage of power and limitation, flexibility and restriction — but it certainly isn't boring!